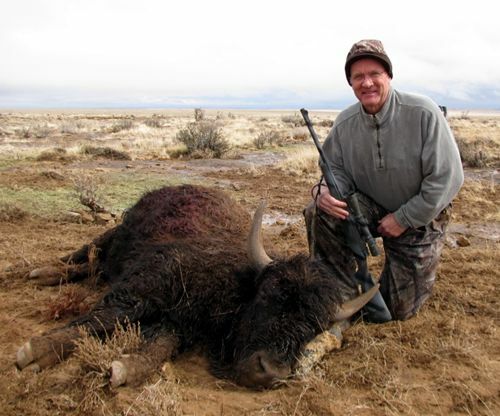 Arizona does offer buffalo hunts, in two different locations. 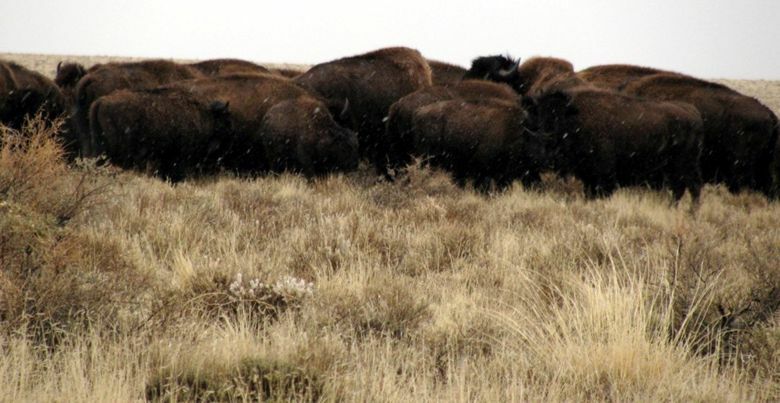 Buffalo roam at House Rock Ranch north of the Grand Canyon. There they often retreat into Grand Canyon Park, where no hunting is allowed. Another herd calls Raymond Wildlife Refuge east of Flagstaff home. Some 25 years ago I had drawn a yearling permit at House Rock, my first try ever for buffalo. There were 27 permits for that hunt. It turned out tough hunting, mostly in designated wilderness. I ended up not getting a shot, even though I had seen the herd. Then some years later I accompanied a friend from work on his House Rock hunt. We failed to find buffalo on that weekend. Ever since my first hunt I continued to apply for yearling permits. Persistence paid off. For 2013 I drew again! This time for the Raymond hunt. To say it up front, it was not nearly as much a hunt as the others. We were only two hunters, and met at headquarters at 8 AM on opening day. The Game & Fish guys explained their plan, specifically that they wanted two young bulls taken, if possible. The hunt was on. The terrain has no tall vegetation for any big game to hide in, and certainly not a whole herd of very big brown beasts. That morning the buffalo were on higher ground, and so we found the herd fairly quickly. The wind was strong, often carrying rain and some wet snow flakes. The buffalo let us approach within about a hundred yards. We did this in a direction which would tend to push the herd more towards the Raymond center, rather than to its borders. Once in position we studied the individual animals. I had permit #1, so I was declared shooter #1. It was neat observing the entire herd through the binoculars. Those big bulls are awesome and rugged. Word is that a barbed wire fence is more of a suggestion to these big animals, for sure no confinement. If they feel like it, they’ll walk right through. Soon the Game & Fish officer stated “the one all the way to the right”. I almost responded with ‘are you sure’, for that young bull looked nicely big. Instead I counted my blessings, aimed and squeezed. The buffalo hunched up when 260 grains of Partition plowed through, staggered and went down. My hunt was over. “Wow, you shot him fast,” was the officer’s response. The herd did not blow out of there when my Mauser barked. Instead they surrounded the fallen bull. This gave shooter #2 (Tatum, I guessed her at age 14) an opportunity. OK, she took a lot longer to make her first shot, then needed a second. That time her 140 grain Barnes from a 7mm-08 hit the heart, and her bull ran for about fifty paces before collapsing. Now the herd surrounded that fallen bull as well. The buffalo surrounded the fallen young bull immediately after he went down. Per Game & Fish instruction, we all withdrew. Apparently the herd says its ‘good bye’ to the fallen, then moves on. Because when we returned about an hour later, the herd was indeed gone and out of sight. It had also stopped raining and snowing. The cold wind had not, a blessing. The work began. No, the officers will not assist from then on, but they did take pictures. Tatum had it better, with her dad and uncle doing all the red work. Since David got called into work despite taking a vacation day, I had gotten out of bed at 3 AM that opening morning, driven to headquarters by myself. It was the weekend of a decent winter storm hitting Arizona. Now, at about 10:30 AM I stood by my bull, a bigger body than any elk I’d ever worked on. At least I had done one thing right. Knowing from Google map that there were absolutely no trees around, I had brought ‘my own’, in the form of a tall saw horse. The one thing I should have thought of and also prepared for was ‘managing’ the bull’s legs while gutting. I should have had some type of post to pound into the ground and tie two legs to that. David the next day had a simple question: why didn’t you drive your vehicle over there and tie the legs to that? Didn’t think of that, which would have made the job a lot easier. So it took me past 2 PM to get all the meat hanging. I cleaned up a little, had lunch. Next move was to debone the meat so it would fit into my ice chests. Snow and rain returned for that. At one time all the hanging protein was covered in white from the driven snow. I appreciated that because for sure all meat was nicely cooled when I later placed it into the ice chests. Finally it was time to clean everything up, disassemble that saw horse, and pack things up. 4Runner was rolling by 5:30 PM. Sure enough, near Flagstaff all had turned white, eventually also the freeway lanes. And once I was back on I-17 heading south, we all stopped. People going for little sled rides in their cars and getting stuck in the median added at least ninety minutes to my trip. I was home by 9:30 PM, tired but quite happy! My once-in-a-lifetime hunt has already carved out a favorable place in my memory bank. Lots to thank God for! The next day David came over to help butcher all that meat. By 3 PM we did not quite have it done. Sunday I finished that and also wanted to work on the ‘trophy’. 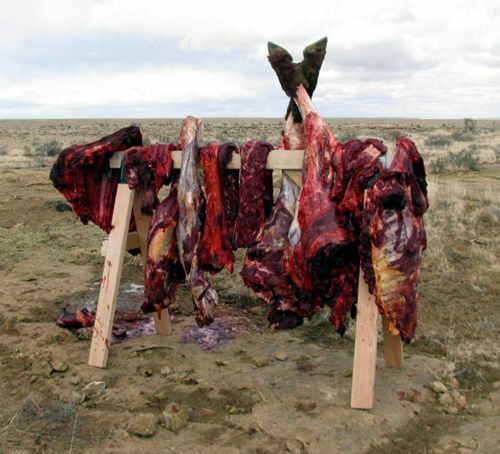 Well, years ago I had arranged for a 20 gallon drum to serve as big pot to boil all the meat off bull elk skulls. On my brother’s last hunt here we had both elk heads in there at the same time. Bad news! A buff is built differently. That 20 gallon ‘pot’ was too small. Luckily, David had an old 55gal drum around that he had used for testing outboard motors. He shortened that for me just enough for the buffalo head to fit. Even so, it took over two hours to bring all the water to boil. At least that worked out, and I could get all the buff hunt done in one long but rewarding weekend.